2. the beat of the heart as felt through the walls of a peripheral artery, such as that felt in the radial artery at the wrist. 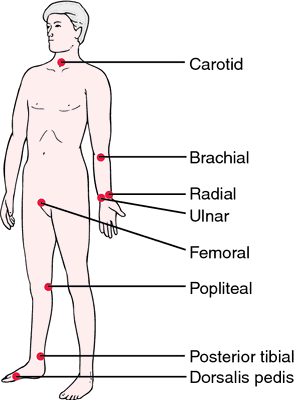 Other sites for pulse measurement include the side of the neck (carotid artery), the antecubital fossa (brachial artery), the temple (temporal artery), the anterior side of the hip bone (femoral artery), the back of the knee (popliteal artery), and the instep (dorsalis pedis artery). What is felt is not the blood pulsing through the arteries (as is commonly supposed) but a shock wave that travels along the walls of the arteries as the heart contracts. This shock wave is generated by the pounding of the blood as it is ejected from the heart under pressure. It is analogous to the hammering sound heard in steam pipes as the steam is forced into the pipes under pressure. A pulse in the veins is too weak to be felt, although sometimes it is measured by sphygmograph (see below); the tracing obtained is called a phlebogram. The pulse is usually felt just inside the wrist below the thumb by placing two or three fingers lightly upon the radial artery. The examiner's thumb is never used to take a pulse because its own pulse is likely to be confused with that of the patient. Pressure should be light; if the artery is pressed too hard, the pulse will disappear entirely. The number of beats felt in exactly 1 minute is the pulse rate. In taking a pulse, the rate, rhythm, and strength or amplitude of the pulse are noted. The average rate in an adult is between 60 and 100 beats per minute. The rhythm is checked for possible irregularities, which may be an indication of the general condition of the heart and the circulatory system. The amplitude of a pulse can range from totally impalpable to bounding and full; however, such terms are vague and subject to misinterpretation. To provide a more standardized description of pulse amplitude some agencies and hospitals use a scale that provides a more objective evaluation and reporting of the force of a pulse. On such a scale zero would mean that the pulse cannot be felt; +1 would indicate a thready, weak pulse that is difficult to palpate, fades in and out, and is easily obliterated with slight pressure; +2 would be a pulse that requires light palpation but once located would be stronger than a +1; +3 would be considered normal; and a +4 pulse would be one that is strong, bounding, easily palpated, and perhaps hyperactive, and could indicate a pathological condition such as aortic regurgitation. If a pulse is noted to be weaker during inhalation and stronger during exhalation (pulsus paradoxus), this could indicate either greater reduction in the flow of blood to the left ventricle than is normal, as in constrictive pericarditis or pericardial effusion, or a grossly exaggerated inspiratory maneuver, as in tracheal obstruction, asthma, or emphysema. An instrument for registering the movements, form, and force of the arterial pulse is called a sphygmograph. The sphygmographic tracing (or pulse tracing) consists of a curve having a sudden rise (primary elevation) followed by a sudden fall, after which there is a gradual descent marked by a number of secondary elevations. Pulses palpated during assessment of the arterial system. abdominal pulse that over the abdominal aorta. alternating pulse one with regular alteration of weak and strong beats without changes in cycle length. Called also pulsus alternans. anacrotic pulse one in which the ascending limb of the tracing shows a transient drop in amplitude, or a notch. anadicrotic pulse one in which the ascending limb of the tracing shows two extra small waves or notches. anatricrotic pulse one in which the ascending limb of the tracing shows three extra small waves or notches. apical pulse the pulse over the apex of the heart, as heard through a stethoscope or palpated. atrial venous pulse (atriovenous pulse) a venous pulse in the neck that has an accentuated a wave during atrial systole, owing to increased force of contraction of the right atrium; a characteristic of tricuspid stenosis. bigeminal pulse one in which two beats occur in rapid succession, the groups of two being separated by a longer interval, usually related to regularly occurring ventricular premature beats. Called also pulsus bigeminus. brachial pulse that which is felt over the brachial artery at the inner aspect of the elbow; palpated before taking blood pressure to determine location for the stethoscope. carotid pulse the pulse felt over the carotid artery, which lies between the larynx and the sternocleidomastoid muscle in the neck; frequently used to assess effectiveness of cardiac massage during cardiopulmonary resuscitation. 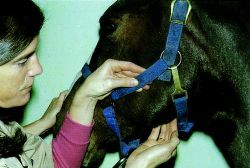 It can be felt by pushing the muscle to the side and pressing against the larynx, or, if the patient is dyspneic, by palpating the pulse at the groove in the muscle. catadicrotic pulse one in which the descending limb of the tracing shows two small notches. catatricrotic pulse one in which the descending limb of the tracing shows three small additional waves or notches. Corrigan's pulse a jerky pulse with full expansion and sudden collapse occurring in aortic regurgitation; called also water-hammer pulse. dicrotic pulse a pulse characterized by two peaks, the second peak occurring in diastole and being an exaggeration of the dicrotic wave; called also pulsus bisferiens. dorsalis pedis pulse the pulse felt on the top of the foot, between the first and second metatarsal bones. In 8 to 10 per cent of the population this pulse cannot be detected. entoptic pulse a subjective sensation of seeing a flash of light in the dark with each heart beat. femoral pulse one located where the femoral artery passes through the groin in the femoral triangle. funic pulse the arterial tide in the umbilical cord. hard pulse (high-tension pulse) one with a gradual impulse, long duration, slow subsidence, and a firm state of the artery between beats. jerky pulse one in which the artery is suddenly and markedly distended. paradoxical pulse one that markedly decreases in amplitude during inhalation, as often occurs in constrictive pericarditis. plateau pulse one that is slowly rising and sustained. popliteal pulse one palpated in the popliteal fossa, most easily detected when the patient is lying prone with the knee flexed about 45 degrees. posterior tibial pulse a pulse felt over the posterior tibial artery just posterior to the ankle bone on the inner aspect of the ankle. quick pulse one that strikes the finger smartly and leaves it quickly; called also pulsus celer. Quincke's pulse alternate blanching and flushing of the skin that may be elicited in several ways, such as by pressing on the end of the nail and observing the nail bed or skin at the root of the nail. It is caused by pulsation of subpapillary arteriolar and venous plexuses and is sometimes seen in aortic insufficiency, although it may occur in normal persons under certain conditions. Called also capillary pulse (because it was formerly thought to be due to pulsations in the capillaries) and Quincke's sign. radial pulse that felt over the radial artery at the wrist. Riegel's pulse one that is diminished during respiration. slow pulse one with less than the usual number of pulsations per minute; called also vagus pulse and pulsus tardus. thready pulse one that is very fine and scarcely perceptible. tricrotic pulse one in which the tracing shows three marked expansions in one beat of the artery. trigeminal pulse one with a pause after every third beat. venous pulse the pulsation over a vein, especially over the right jugular vein. wiry pulse a small, tense pulse. mechanical alternation; a pulse regular in time but with alternate beats stronger and weaker, often detectable only with the sphygmomanometer or other pressure measurement and usually indicating serious myocardial disease. Mechanical alternation, a pulse regular in time but with alternate beats stronger and weaker, often detectable only with the sphygmomanometer and usually indicating serious myocardial disease. 2. any leguminous seed used in animal feed or human food. Contain about 20% protein. 3. the beat of the heart as felt through the walls of arteries. What is felt is not the blood pulsing through the arteries but a shock wave, generated by the abrupt ejection of blood from the heart, that travels along the arteries. The arterial pulse wave can be measured by a sphygmograph. The resulting tracing shows ascending and descending limbs. that over the abdominal aorta. includes irregularity of timing and amplitude, large or small amplitude, waterhammer pulse, Corrigan's pulse, dropped pulse, pulse deficit, alternating pulse and many others. pulsus alternans; one with regular alteration of weak and strong beats without changes in cycle length. indicative of arterial blood pressure; estimated on the difference of pressure exerted by the fingers to occlude and then reopen the arterial pulse. one in which the ascending limb of the tracing shows a transient drop in amplitude, or a notch. one in which the ascending limb of the tracing shows two small additional waves or notches. one in which the ascending limb of the tracing shows three small additional waves or notches. the wave of pressure generated by the ejection of blood from the left ventricle into the aorta. Although the size (amplitude) of the pulse depends on the volume ejected it is not the blood passing the finger that is palpated, it is only the pressure wave. The pulse is a good indicator of the heart's activity with respect to amplitude, rate and regularity. It may also provide information on the state of the vessel walls and the efficiency of the aortic semilunar valves. It may be palpated in the median, facial, femoral or coccygeal arteries, the preferred site varying with the species and the occasion. atriovenous pulse, a cervical pulse having an accentuated 'a' wave during atrial systole, owing to increased force of contraction of the right atrium; a characteristic of tricuspid stenosis. one in which two beats occur in rapid succession, the groups of two being separated by a longer interval, usually related to regularly occurring ventricular premature beats. to study the movement of macromolecules, cells are incubated with a radiolabeled precursor (pulse) and then replaced with unlabeled precursor (chase). The label can be followed as it is incorporated into newly synthesized compounds and through different cellular compartments. the difference between the apical pulse and the radial pulse. Obtained by counting apical beats as heard through a stethoscope over the heart and counting the arterial pulse at the same time. A characteristic of several arrhythmias. a pulse characterized by two peaks, the second peak occurring in diastole and being an exaggeration of the dicrotic wave. the administration of drugs, usually antibiotics or corticosteroids, in a single, large dose which might be repeated after an interval of days. Thought to have the advantage of high tissue levels and fewer of the undesirable side-effects associated with more frequent dosing. that which is located at the site where the femoral artery passes through the groin in the femoral triangle; the usual site for palpating the pulse in dogs and cats. an ultrasound detector based on the Doppler principle used to detect the presence of a living fetus in utero. the arterial tide in the umbilical cord. the power source for a cardiac pacemaker system, usually powered by a lithium battery. It supplies electrical impulses to the implanted electrodes. See also pacemaker. one characterized by high tension. comprises the movements of the wall of the jugular vein in response to pressure changes in the right atrium. Much more visible if the vein is distended. A reflection of increased pressure in the right atrium or insufficiency of the right A-V valve. A small pulse is normal in most food animals. A large pulse which goes high up the neck when the head is in the normal position, and which is synchronous with the heart cycle and is systolic in time, indicates insufficiency of the right atrioventricular valve. a pulse detector which uses the Doppler principle. one that markedly decreases in amplitude during inspiration. that palpable in the extremities, e.g. legs, neck and head; the usual sites for measuring the pulse rate. one in which the arteries are subject to sudden distention and collapse. the difference between the systolic and diastolic pressures. that felt over the radial artery. the number of pulsations per minute palpable in an artery, usually of a limb. The normal rates per minute for the common domestic animal species are: horses, 30 to 40; young horses up to one year of age, 70 to 80; cattle, 60 to 80; young calves, 100 to 120; sheep and goats, 70 to 120; pigs (heart rate), 60 to 70; dogs, 100 to 130; cats, 110 to 140; adult fowls 250 to 300.
regularity of the pulse in time and amplitude. one that is very fine and barely perceptible. one with a pause after every third beat. one giving the sensation of successive waves. the pulsation over a vein. one in which the artery is suddenly and markedly distended and relaxed. Characteristic of patent ductus arteriosus. Called also Corrigan's, jerky and B-B shot pulse.